Salman Rushdie’s ‘Midnight’s Children’, first published in 1980, won both the Booker Prize and the James Tait Black Memorial Prize in 1981. The midnight’s children of the novel’s title are born as India and Pakistan come into existence on August 14-15, 1947. Rushdie himself was born in 1947, though not in August. Artists born in 1980 and 1981, the years when the novel was published and received its major awards, are now of the age that Rushdie and ‘Midnight’s Children’ were in 1980 and 1981. 1980-1981 produced a very strong cohort of artists, and nine of them feature in the exhibition: Aaditi Joshi, Charmi Gada Shah, Manish Nai, Nandan Ghiya, Prajakta Potnis, Rathin Barman, Shreyas Karle, Sujith Sn, and Theegulla Venkanna. 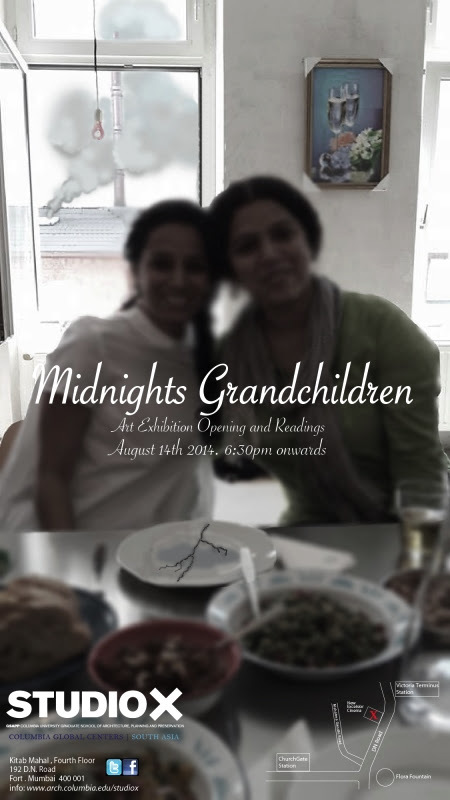 The opening of the show is timed to coincide with the birth of Midnight’s Children, on August 14th, 2014. There will be a discussion and readings alongside the exhibition opening. This entry was posted in Prajakta Potnis, Shreyas Karle and tagged Midnight's Children, Midnight's Grandchildren, Mumbai, Prajakta Potnis, Salman Rushdie, Shreyas Karle, Studio X. Bookmark the permalink.